Day of reckoning for tuition fees? Justin Trudeau in India: Is the Canadian PM being cold-shouldered? 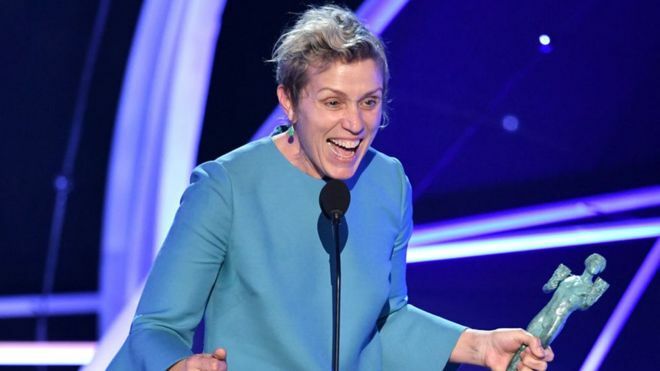 Black comedy Three Billboards Outside Ebbing, Missouri scooped the top prize at the Screen Actors Guild awards. The film about a bereaved mother’s fight for justice picked up the prestigious outstanding cast in a film prize at Sunday’s ceremony. It also collected two acting honours for Frances McDormand and Sam Rockwell. British star Gary Oldman, hotly tipped for an Oscar for his turn as Winston Churchill in Darkest Hour, picked up the best actor prize. Oldman fought back tears and called the award “a tremendous honour”. The ceremony was dominated by support for the fight against sexual misconduct in Hollywood, with several speeches about female empowerment. Rosanna Arquette, one of the actresses to allege she was harassed by producer Harvey Weinstein, was applauded on stage at the ceremony as she presented an award, accompanied by Marisa Tomei. The pair also paid tribute to other accusers, including Asia Argento, Ashley Judd and Mira Sorvino. Anthony Rapp, who alleged he was harassed by Kevin Spacey, was also praised by Tomei. “We are inspired that so many powerful voices are no longer silenced by the fear of retaliation,” the actress said. Both Spacey and Weinstein have denied allegations against them. The red carpet was awash with colour after the Golden Globes ceremony earlier this month were dominated by black to show solidarity with victims of sexual assault and harassment. The SAGs have never had a host before but this year opted to have one, with Kristen Bell taking the helm. Bell said: “We are living in a watershed moment and as we march forward with active momentum and open ears, let’s make sure we are leading the charge with empathy and diligence. Other awards went to Allison Janney, who picked up best supporting actress for I, Tonya, while in the TV categories, Claire Foy won best actress for The Crown, and Julia Louis-Dreyfus picked up best comedy actress for Veep. Louis-Dreyfus was accorded four more awards and, in doing so, made history – becoming the first TV actress to win five individual honours at the ceremony. The 57-year-old, however, was not present to collect her trophies because she is currently receiving treatment for breast cancer. Nicole Kidman won outstanding performance by a female actor in a TV movie or limited series for her role as a victim of domestic violence in Big Little Lies. The 50-year-old star said: “How wonderful it is that our careers can go beyond 40 years old. Her co-star Alexander Skarsgard won the outstanding performance by a male actor prize for playing her abusive husband. Family drama This Is Us picked up the ensemble in a drama series prize, while its star, Sterling K Brown, picked up the male actor in a drama series award. That made him the first black man to win the SAG for outstanding performance by a male actor in a drama series. Meanwhile, Morgan Freeman said he was receiving “a place in history” as he was honoured with a life achievement award. And in other awards news, Guillermo del Toro’s fantasy romance The Shape of Water took home best film at the Producers Guild Awards on Saturday. The Oscar nominations will be announced on Tuesday. i14news.tv is among the world's leaders in online news and information delivery. Staffed 24 hours, seven days a week by a dedicated staff in i14's world headquarters in UK, London, and in bureaus worldwide, i14news.tv relies heavily on i14's global team of almost 1,000 news professionals. © 2018 i14 News Network. All Rights Reserved.